Check the support page (rugoso.com/seekbeats) to see a 2 minute video, watch and hear for yourself what's it all about! 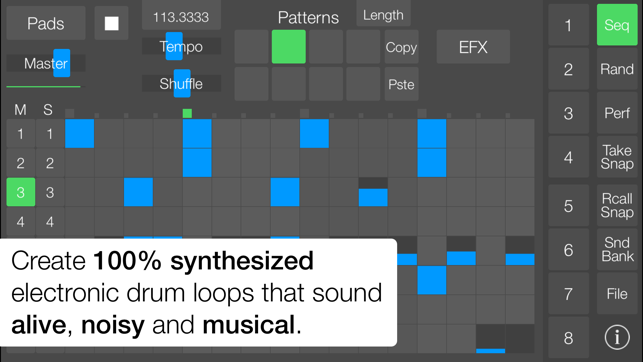 Create 100% synthesized electronic drum loops that sound alive, noisy and musical. 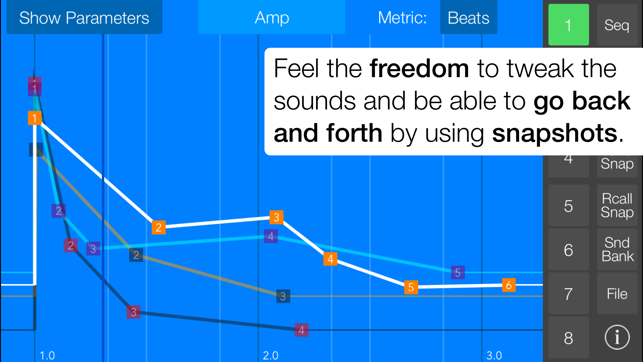 Feel the freedom to tweak the sounds and be able to go back and forth by using snapshots. • Eight voices, each with different synth parameters and envelopes. 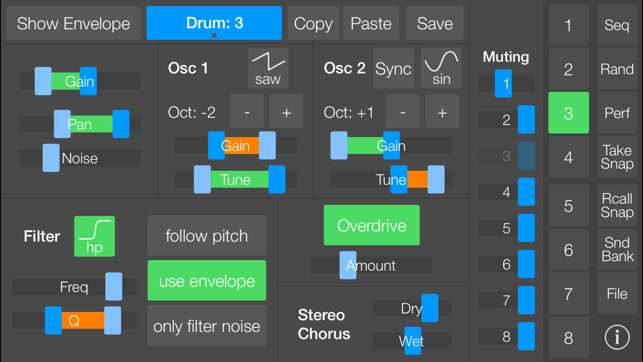 • Step Sequencer, with velocity for each step that can be mapped to different parameters. 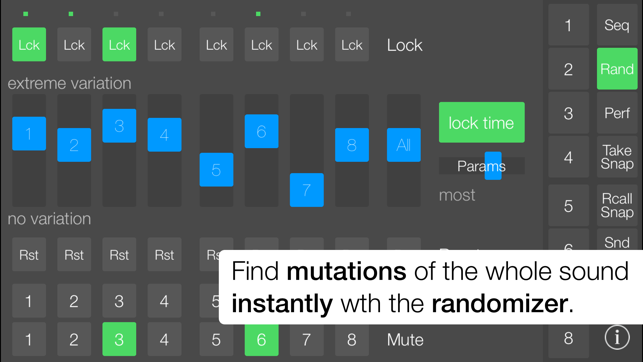 • Randomizer: Mutate the whole sound of your drums instantly with the slide of your finger. • Snapshots: Feel all the freedom to explore with your sound, go back and forth by taking and recalling snapshots. 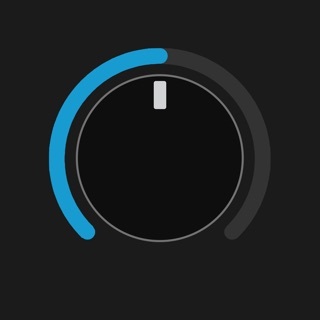 Change the whole sound of your drums with one tap. • Sound Banks: Load and save your favorite sounds. • Stereo Chorus, Global Compression and Global Distortion. • Supports Audiobus. Inter App Audio. Master Out + 8 channels (1 per Drum). Check these App Store reviews! If you were thinking about getting a similar hardware drum machine, it would probably cost you hundreds of dollars, SeekBeats is just 11.99 dollars (USA). PLEASE NOTE: REQUIRES iPhone 4S or faster. iPod Touch 5th generation (4 inch display) or faster. iPad 2 or faster. Added a play/stop button to the performance view. Just that, very small update. As the title suggests, I love this app like crazy, but lack of midi control is killing my live set. You only have midi for 8 patterns and each drum for finger drumming. At bare min give us snapshot selection too... And snapshot - pattern combo presets. And more than 8 patterns. Or sell the engine to someone who will. Midi llearn should be on every feature like every other decent drum or synth app... 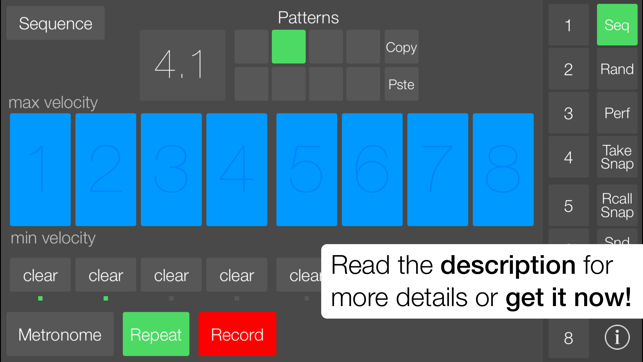 Check patterning and ElasticDrums for inspiration. The sounds are PHENOMENAL though, and randomize features are fantastic. Please add more midi so I can really use those sound engines to their potential. AU3 for even more cred, make it an iap, take my money!!!! This is still my go-to application for synthesized drums. I have yet to find a better interface for tweaking and experimenting, along with using as a basic drum sequencer. I use other apps for sampled drums, but this one is the best for making your own! 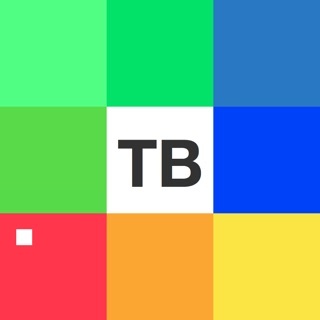 I have been able to replicate a lot of classic drum machine sounds with the tools in this app; it can sound pretty close to analog drums with proper tweaking. Excellent!